The Macedonian economy has weathered the post-2008 crisis better than most countries in the Balkans. Investments and exports have sustained growth and the performance of the labour market has somewhat improved. With exports to GDP at around 50%, the small, landlocked economy remains relatively closed, though not necessarily by Balkan standards. Also, with an unemployment rate above 20%, which has tended to be even higher for decades now, there is clearly untapped potential for growth and development. Export-led growth is what the long-term macroeconomic framework has been designed for. There is a fixed exchange rate regime since 1994. Fiscal policy aimed at a balanced general budget for most of the pre 2008 period. Overall, the real exchange rate was not misaligned, so that a more active income and fiscal policy was available post-2008. Finally, an open foreign trade regime, with free trade with the EU and within the regional market of CEFTA, was supportive of growing exports in the last ten or so years. The tradable sector remains small for the size of the economy, not sufficiently diversified and internationalised, with a dominance of larger firms, and not appropriately innovative. A small open economy in the context of internationalisation of production and trade grows through exports by expanding its tradable sector along both the extensive and the intensive margins. That also means that there is a lot of space for innovative activities that can access the large, primarily European market, even if those are small and medium-size companies. With export-led growth remaining the main policy end, the economy is adapted to the stability that the long-term policy framework provides. There are possible improvements to the fiscal system and there is the need of better targeting of public investments. The main policy interventions should be in support of innovation, easier access to the product market in support of entrepreneurship, support for internationalisation of economic activities, and as much support for innovation as possible. Both public policies and the financial system should be supportive of these improvements in the product market. Finally, sustain growth and catching up with the more developed economies require sustained and efficient active labour market policies to bring the unemployment rate down to low single digits. 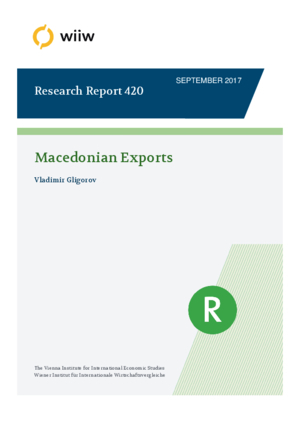 With productivity improvements, the level of the Macedonian economy is about 20% below potential. With a potential growth rate of around 4%, within a generation Macedonian GDP per capita can be close to the EU average.